The start of the next financial year, 1 April 2018, sees the arrival of the Minimum Energy Efficiency Standard (MEES) Regulations. These are regarded as a welcome step towards improving the energy performance of some of the least energy-efficient properties in England and Wales. Any properties below an ‘E’ energy rating will be regarded as ‘sub-standard’, with the MEES regulations applying from the following dates. • 1 April 2023. It will be an offence to continue to let a sub-standard commercial property, including all leases. Under the regulations, it will be unlawful to rent out property, residential and commercial, that does not meet a minimum EPC rating of E unless they have made all possible cost-effective energy-efficiency improvements. There are some exceptions to this rule, but most offices, shops and other commercial buildings are included. A survey conducted earlier this year by major energy supplier E.ON, found that almost 45 per cent of commercial landlords have little or no understanding of the MEES regulations and more than half of the landlords surveyed stated that at least 40 per cent of their property portfolio did not currently comply. The regulations mean that from April 2018 landlords will be unable to let any commercial building with an energy performance certificate (EPC) of F or G or renew contracts with existing tenants. Landlords found to be in breach of the MEES regulations three months after the April 2018 deadline will receive fines of 20 per cent of the rateable value, up to a maximum of £150,000. The building-services sector can expect to benefit widely from the introduction of MEES, with companies already noticing an increase in enquiries from concerned landlords who need help to make a compelling case for investment in energy efficiency measures. Building owners and landlords should be looking now at what they can do to mitigate the impact of MEES. There are also financial benefits on offer from Government schemes that can help support an upgrade and reduce the payback period. Mitsubishi has been working towards better energy efficiency at its Hatfield headquarters, where the 1980’s, steel and glass building was upgraded from an ‘E’ to a ‘B’ energy rating. As with any other business, Mitsubishi had to make a strong case for budget to upgrade building services, but with careful planning, we have been able to show how anyone can improve their energy rating. Government initiatives and schemes can also be used to help cover any initial expenditure and businesses should benefit almost immediately with better control of their heating, cooling and ventilation along with potential savings in running costs from modern systems. Anyone choosing a new air conditioning or ventilation system should make sure that it is listed on the Government’s Enhanced Capital Allowence (ECA) Scheme, which means that the capital costs can be offset against the business’s annual corporation tax. Including a form of renewable heating by adding in a ground or air source heat pump for hot water production can also benefit the company by making it eligible for 20 years of payment under the Renewable Heat Incentive (RHI). Under the MEES regulations landlords will be able to argue that their property is exempt because the energy-efficiency improvements needed are not cost-effective. The Government guidance on the steps needed to meet the MEES requirements state that ‘cost effective’ broadly means an improvement that offers payback within seven years. 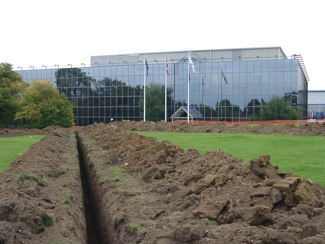 Mitsubishi’s Hatfield HQ has its ground-source heat pump installed to improve energy efficiency. Support under the ECA scheme and the RHI are able to significantly reduce payback periods, so this is only likely to apply to buildings that require a major change to the structure or insulation of a building. So any landlord hoping to avoid taking any action really needs to understand this. Each building will be different and require a different solution but the first step should involve getting expert advice from a trusted energy partner, a product manufacturer or an approved installer. Whatever landlords think of MEES, there is no hiding from it and the major lesson that our own example with our headquarters shows, is that improving your building services and making them work harder for you will not only achieve compliance but can also lower monthly energy bills in the long-term.